Is it determined by "Restore points to keep on disk"? on the backup jobs? On the 31st day it will be removed from Azure Blob. If a scenario came and we lost the Veeam backup and replication server + the SQL db and had to start from scratch with no NAS / no local backups. We install veeam backup and replication on a new VM. All of a sudden the domain controller requires a restore, how do we link Veeam backup and replication back to Azure so we can pull the backups down from the Azure blob and use them for a restore? Is there an article or advice for this scenario ? Backup server will re-scan object storage repository, find previous backups there and download dehydrated copies of them to local extent. After that, you will be able to execute restore process. Thanks for the great instructions i will try to setup a lab to run through the scenario shortly. if the backups have been encrypted on the capacity tier when setting up the scale-out repository is there any gotchas we need be aware of? I assume all we would do when setting the scale-out Backup Repository up is put the password back into the tick box on the capacity tier which reads "Encrypt data uploaded to object storage" and it would be able to decrypt the backups and be able to use them for restores etc? Your understanding is correct, you will just need to input the same password that was used for encryption. Thanks! All of full and incremental backups are downloaded automatically? Can we see the downloading progress? Lost Veeam Backup & Replication server scenario, networkup wrote. Then I am confirming - no backups will be downloaded automatically, only metadata. If you want to download actual backups, you will have to manually initiate the process. Normally it's not needed though, because you can restore directly from object storage. So, the only times when you would want to download, are scenarios where you need to perform multiple restores from the same backup. For example, provisioning multiple on-demand sandboxes for developers to play with. Please correct me if I'm wrong - thanks. You're correct - only inactive or sealed part of backup chain gets offloaded to capacity tier. More information can be found here. Ability to copy all (not just move oldest) backup files to capacity tier as soon as they are created is planned for future releases indeed. It is purposely disabled to prevent people from quoting the immediate post you should still see this button on other posts. Thanks! Hi guys just after some quick confirmation of my understanding. We have all of our jobs running reverse incremental backups all week with a full active backup every Saturday. 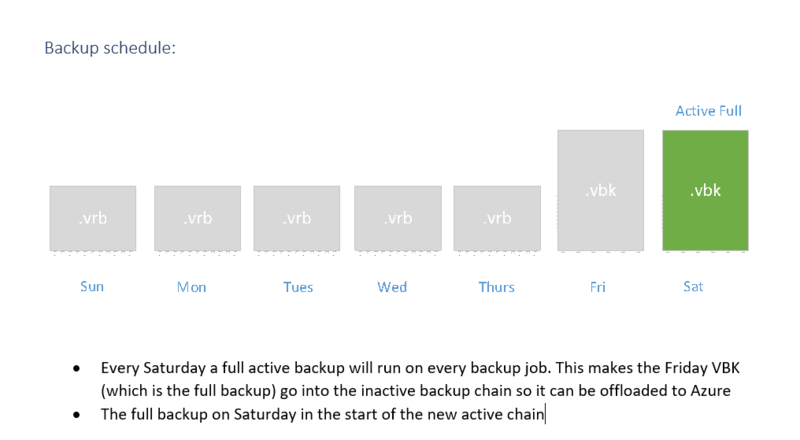 Does this mean Fridays file will stay a VBK and become inactive allowing it to be in a state ready for Azure offload? And Saturdays VBK will be the start of the new active chain? Hi Adam, that is correct. Thanks! I just saw this mentioned elsewhere, I just wanted to bring it up here as well for verification and because it's relevant: "Capacity" Tier can only be Cold tier Blob and not Archival, correct? I saw this is because once something is moved to Archival tier Veeam will lose connection to it. This of course changes pricing by x5. Is a VLT on Azure the only solution for this for now then? Even with 30 TB, the difference is significant.